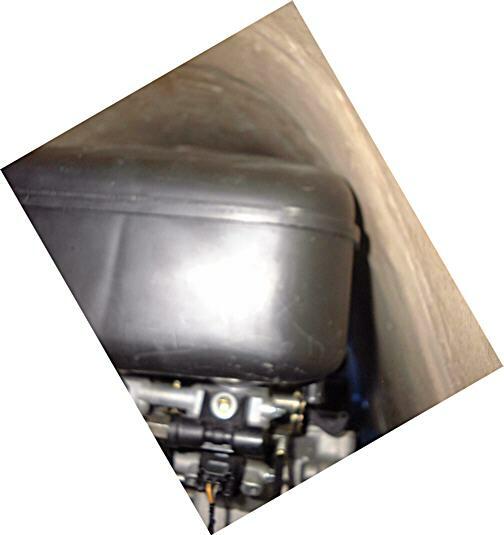 We continued installing the Hayabusa (Suzuki GSXR-1300) motor in our car. Over the previous week, Mark had made some motor mount parts so our first step was to install those. The picture above shows the stainless steel brackets being test fit before welding. 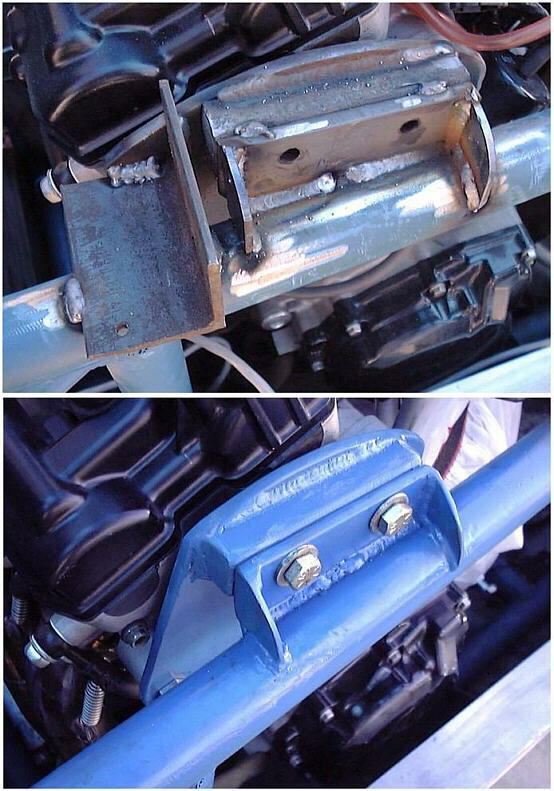 The front-upper mounts were ever further along, they just needed to be tapped, finish welded, and then cleaned up. These were made of regular steel, so they needed to be painted. Check out the before & after" picture of the left mount. 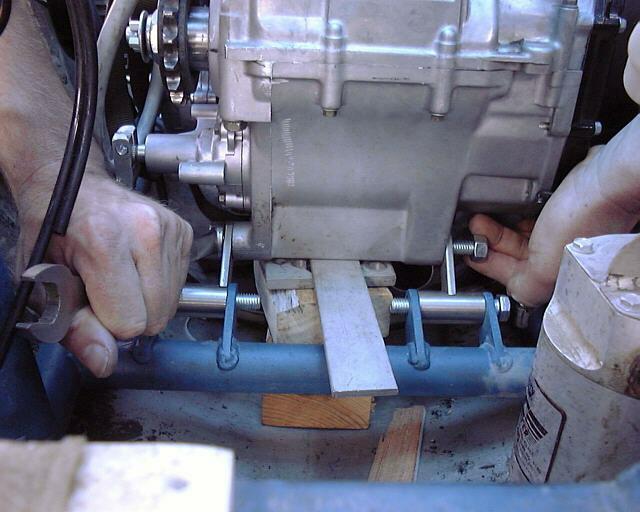 The angle piece in the "before" picture was used to hold the engine in position while the mount was being fabricated. 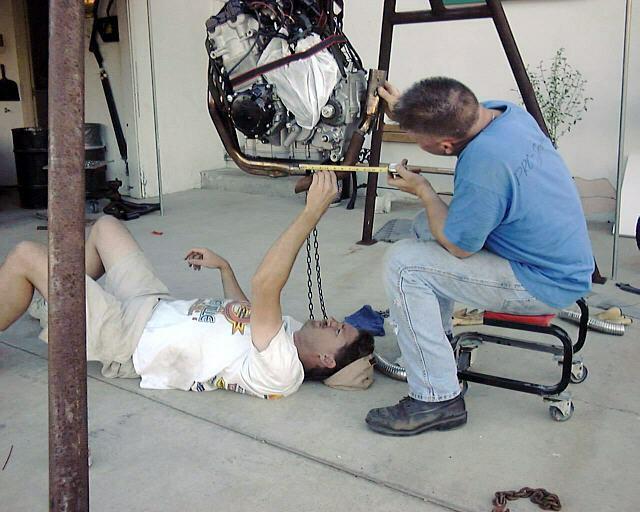 Once all the motor mounts were built, it was time to figure out what to do with the exhaust. It needed to come up between the rear motor mounts. That was not an easy thing to do. We spent quite a bit of time measuring and fitting, and cutting, and finally welding before we were happy with the results. We installed and removed the motor several times during the course of the day, scratching it and the car a little, each time we did it. It really is a tight fit. At one point, with the motor in the car. We wondered if the engine cover would fit over the air-box, so we brought out the cover and tried it. It just barely makes it. I shot this picture by sticking the camera through the exhaust hole and pointing it to where I hoped was the right spot. 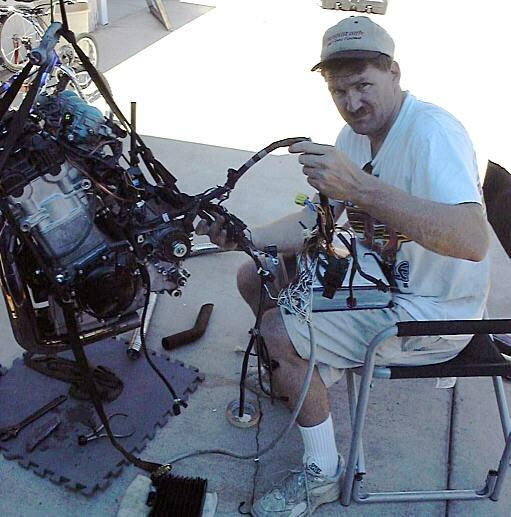 When Alan wasn’t needed for other projects, he started working on identifying the Hayabusa wiring. This is a VERY complex motor electrically, and the Electronic Fuel Injection alone has more sensors than all of our previous motors combined. The EFI measures the ambient air pressure, temperature, and air inflow volume, as well as crank position, cam position and several other things. Alan got to connector #35 and still wasn’t finished, before quitting for the day. See "Spaghetti" . Our up-coming schedule is unknown right now. We have one more weekend before Alan and I leave to time the races at Bonneville SPEEDWEEK. We are going to try to work one day that weekend, but that’s iffy right now.